DANNER X NEW BALANCE | A Continuous Lean. Two great American brands, New Balance and Danner joined forces this fall for the Danner x New Balance â€œAmerican Pioneer Project” and to develop and release two new footwear collaborations. The freshly released New Balance 585 MiUSA sneaker and the Danner Light Boot are the result of this partnership. The collaboration celebrates these two authentic American brands, on opposing coasts, creating two premium, domestically manufactured models that represent the spirit of American craftsmanship, heritage and quality. Seems like an instant victory for all of us who love good-looking American footwear. The New Balance shots in this story were all photographed in and around Portland, Maine for ACL by Matt Cosby. The Danner x New Balance MiUSA 585 was crafted in New Balance’s Skowhegan, ME factory with premium materials and traditional shoemaking expertise. The classic outdoor trail silhouette is done in Horween leather, often found on both Danner and New Balance MiUSA styles, and durable ballistic nylon that lends itself to outdoor adventures. The upper also includes veg tan leather lining and hits on the N logo. The style is finished off with a traditional boot lace, Danner lace lock and co-branded leather insert. A secondary burgundy boot lace is also included. The New Balance MiUSA 585 is being brought back to celebrate the 20th anniversary of the New Balance 580, which is the New Balance Japan designed model inspired by the 585. The model has an unusual history. Like a few models in the mid-nineties, the 585 was introduced in the US and Europe in 1995 and in Japan a year later. 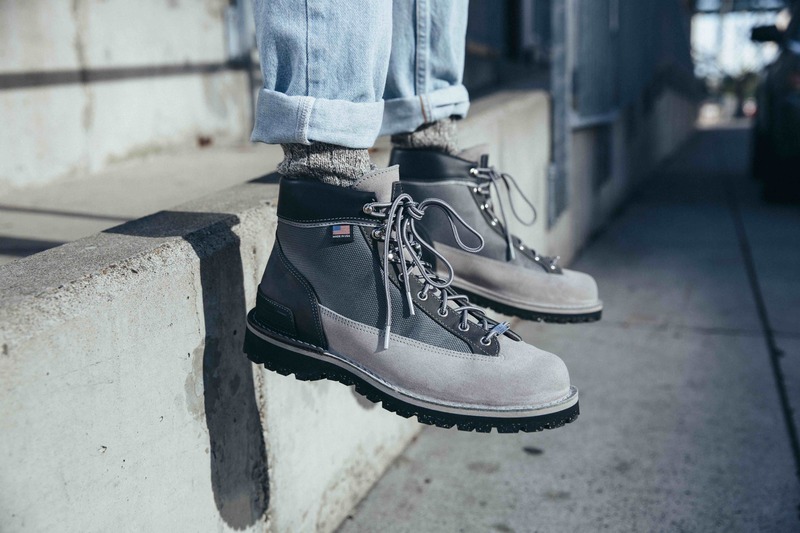 The Danner x New Balance Danner Light boot borrows the New Balance grey color palette to offer an upper done in grey suede, Horween leather, and Cordura. A classic hiking design, the Danner x New Balance Danner Light is manufactured in Danner’s Portland, OR factory and has been dubbed the standard for performance, rugged durability, waterproof protection and craftsmanship. Special additions inspired by New Balance silhouettes include a leather piece on the heel mimicking a CR Device and a reflective underlay on the collar. Additional details include a Vibram outsole for comfort and durability; New Balance branded lace lock; co-branded embossing on the tongue; and a reflective flecked lace and traditional boot lace. This coast-to-coast partnership brings together two iconic adventure-bound footwear brands in one perfect package. We went to Danner’s home of Portland, Oregon to shoot the new Danner x New Balance Danner Light and document some of our favorite spots. We also made our way to Maine – not far from New Balance’s factory there to highlight the new collab 585s, eat some oysters and take in all that Portland, Maine has to offer. (More on our favorite Portland spots soon.) What’s great about this collaboration –beyond two of our favorite brands coming together– is the fact that both these styles work in the city and out. As one would expect from two American pioneers. These Danner photos were all shot in and around Portland, Oregon for ACL by Jules Davies. I agree with Mike, the sneaker is my favorite! New Balance has a new winner on its hands with this sneaker. Love how it looks!